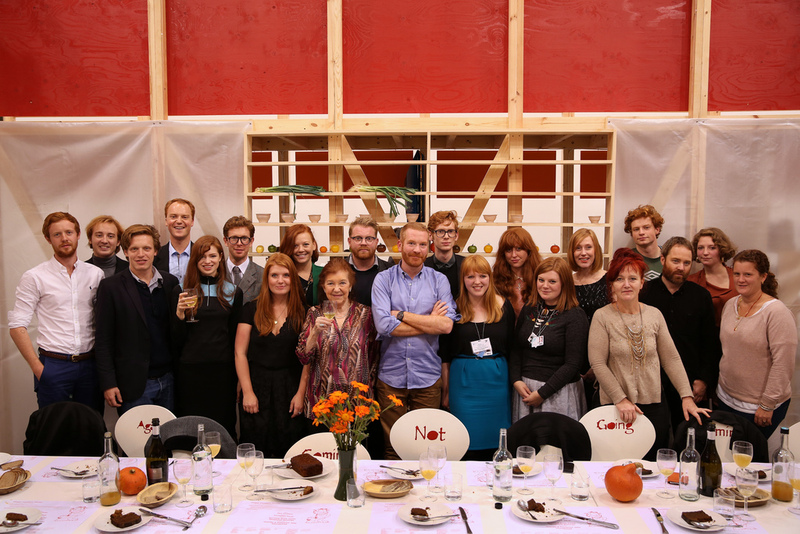 Frieze Art Fair London 2012: artist commissions projects and the Emdash Award. David Burlak, 3rd November 2012. Frieze Art Fair London 2012 has seen a number of artist’ commissioned projects carried out for Frieze Foundation and supported by Emdash Foundation. The winner of the Emdash Award was Cécile B. Evans. Frieze Projects is a unique programme of artists’ commissions realised annually at Frieze Art Fair. Frieze Projects is curated by Sarah McCrory and supported by the Emdash Foundation with additional support from Maharam. The Emdash Award for emerging artists living outside the UK is a major initiative in collaboration with Gasworks and supported by the Emdash Foundation. 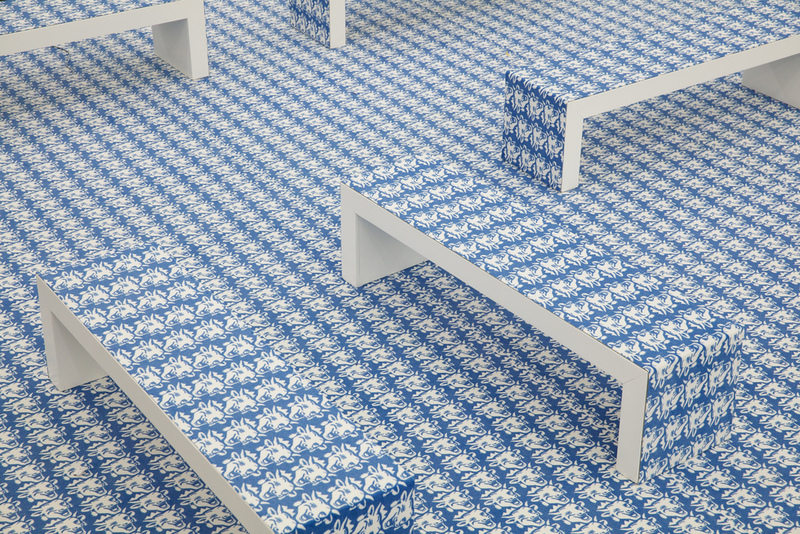 The artists commissioned to create five site-specific works for Frieze Art Fair London 2012 were: Thomas Bayrle, Aslı Çavuşoğlu, DIS magazine, Grizedale Arts / Yangjiang Group and Joanna Rajkowska. of a structure that acts as a forum for a number of artists who produce food, chaotic dining events, performances, and talks. The work was titled: “Colosseum of the Consumed” (2012). It had different variations and a dinner for red- headed – persons was subtitled “Ginger Dinner with Margot Henderson”. 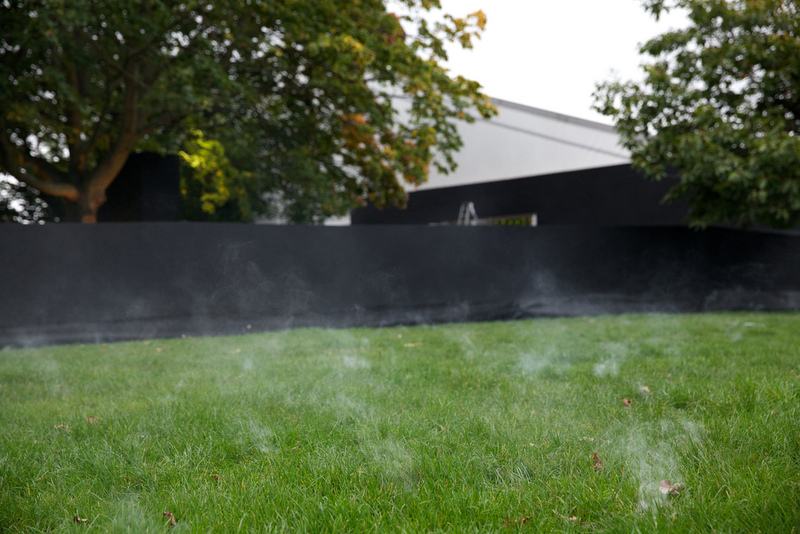 In contrast, Joanna Rajkowska’s work invited contemplation and reflection by transforming an area of Regent’s Park into a field of smoking incense, which was titled: ‘Forcing a Miracle’ (2012). 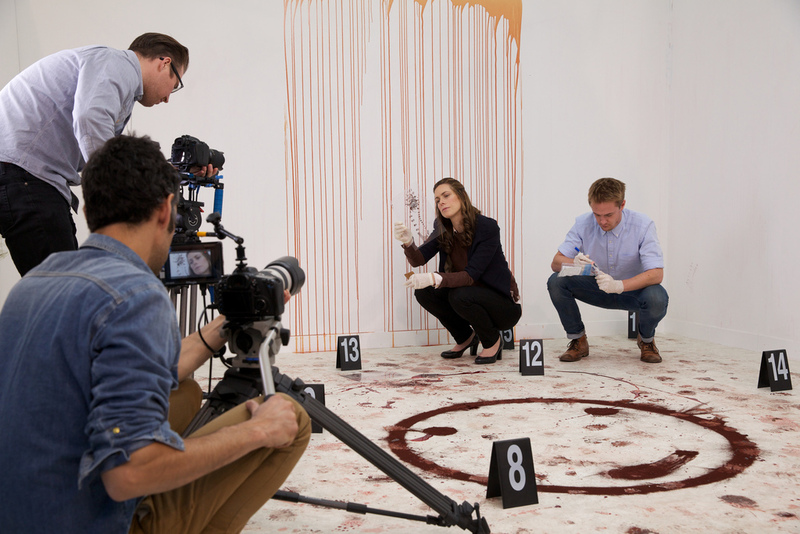 Aslı Çavuşoğlu’s recreation of a crime drama scene found unlikely parallels between the production of murder mysteries and decisions made whilst making art. A reproduction of a crime scene, his work was titled “Murder in three acts” (2012). DIS magazine’s unique approach to the production of imagery was a response to the fair and the title was “Red, Yellow and Blue” (2012) and it is a picture by Eric Wesley (Bortolami Gallery, F11) presenting JW Anderson suit, Delfina Delettrez necklace and bag, Jean Paul Gaultier dress, Kenzo shoes. The winner of the Emdash Award 2012 is the Belgian/American artist Cécile B. Evans, who is based in Berlin. Evans’ winning proposal takes the form of an audio guide to Frieze London accompanied by a holographic ‘host’. The audio guide featured a panel of notable non-art experts. The tile was: “This Is Your Audio Guide” (2012). Curated by Sarah McCrory, Frieze Projects is a programme of artists’ commissions realised annually at Frieze London. Sarah McCrory has been the curator for Frieze Foundation since late 2009 and has been responsible for the Projects and Film at Frieze London for the past three years. In 2009 McCrory, with Curator Daniel Baumann was a Frame advisor and has previously worked in not-for-profit and commercial galleries. McCrory is known for her support and work with emerging, young and underrepresented artists. Emdash Foundation was founded by Andrea Dibelius in 2010, and supporting Frieze Projects for the second year, the Emdash Foundation is a not-for-profit foundation dedicated to promoting new ideas across disciplines from artistic and cultural projects to scientific research. The em dash indicates a pause to reflect and to review – before a clear statement often taking a new direction, follows. Just like the em dash, the Emdash Foundation facilitates new ideas, new impulses and new thoughts. Emdash Foundation’s activities are motivated by philanthropy, a love for the arts and a commitment to supporting new ideas and emerging talent. The Emdash Foundation will aim to support artists on a long-term basis. Frieze Foundation is a non-profit organisation established in 2003. Frieze Foundation is responsible for the curated programme at Frieze Fair. Together with Frieze Projects, the Foundation oversees Frieze Talks, Frieze Music, Frieze Education and Frieze Film. Last year the Foundation will introduced the Emdash Award which is annually presented to an international emerging artist. Since 2003 Frieze Foundation has produced 97 new works from 132 artists. international contemporary art fair. Frieze London is a carefully selected presentation of 175 of the most forward thinking contemporary galleries and presented new work by over 1,000 of the world’s most innovative artists. This year the fair was once again housed in a bespoke temporary structure, in Regent’s Park, designed by architects Carmody Groarke. Frieze London is directed by Matthew Slotover and Amanda Sharp, who founded it in 2003. From 11th until 14th October 2012 at Regent’s Park, London. 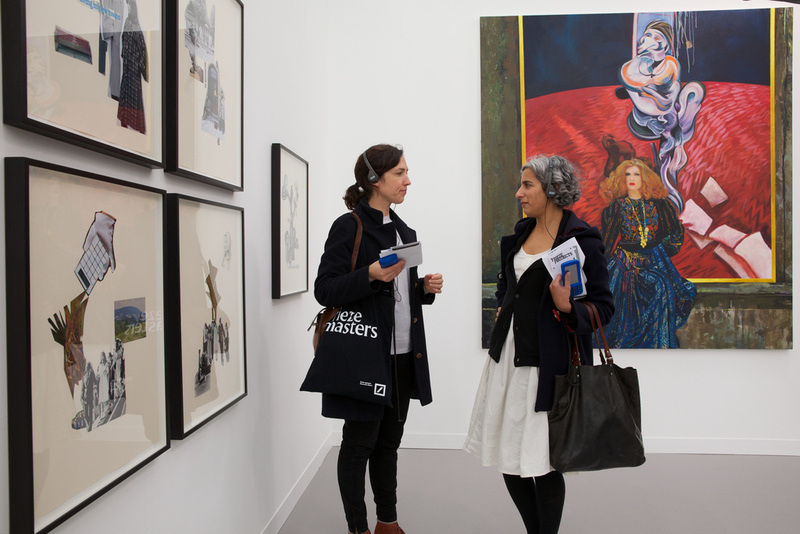 « Frieze Art Fair London 2012 supported the Outset Art Fund for Tate.